A retired detective discovers a puzzling link between the death of a 90-year-old man and the murder of a young woman in Reykjavík during the American occupation in 1944. 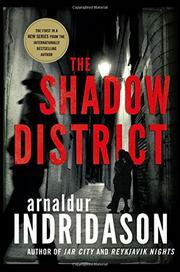 Icelandic novelist Indridason introduces dogged detective Konrád in the first book of a new crime series. After police find pensioner Stefán Thórdarson dead in his bedroom, they attribute the man's passing to natural causes. During the autopsy, though, the pathologist finds indications that he was smothered with a pillow. Over dinner with a former colleague, retired detective Konrád—who finds himself a bit bored—volunteers to look into the case for the short-staffed department; he discovers that Thórdarson had recently been investigating the 1944 murder of Rósamunda, a young seamstress, whose body was found behind the National Theater by two lovers—a philandering American GI and his naïve Icelandic girlfriend. For Konrád, the case rouses his curiosity thanks to his late father’s indirect connection to the victim’s parents and a séance gone bad. The story shifts from present day Reykjavík to 1944, when British and Americans troops occupied Iceland during World War II. Thórdarson, then known as Stephan Thorson, a Canadian officer working with the military police, collaborated with Flóvent, a local detective, to investigate Rósamunda’s murder. Following every lead, they learn of Rósamunda's abortion and question a local herbologist who tells them the far-fetched story that Rósamunda claimed to be raped by the huldufólk, elves in Icelandic folklore, but they also learn of Hrund, a farm girl who told a similar story and later disappeared, an apparent suicide. Back in contemporary Reykjavík , Kónrad follows Thórdarson’s clues from the past investigation, determined to find the old man’s killer and the connection to Rósamunda’s and Hrund’s deaths. With minimalist prose, Indridason skillfully weaves the present-day murder with the past in this classic whodunit that ends with a satisfying and logical resolution.